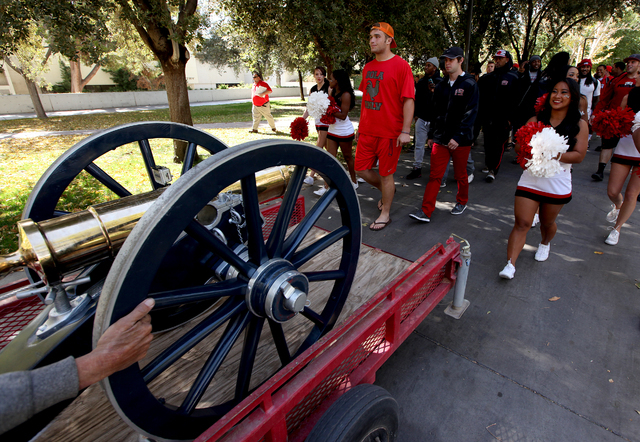 The schools will square off for the 42nd time at 1 p.m. Saturday at Sam Boyd Stadium, where college football’s largest and most expensive rivalry trophy — it weighs 545 pounds and cost $10,000 to build in 1970 — will be on the field. 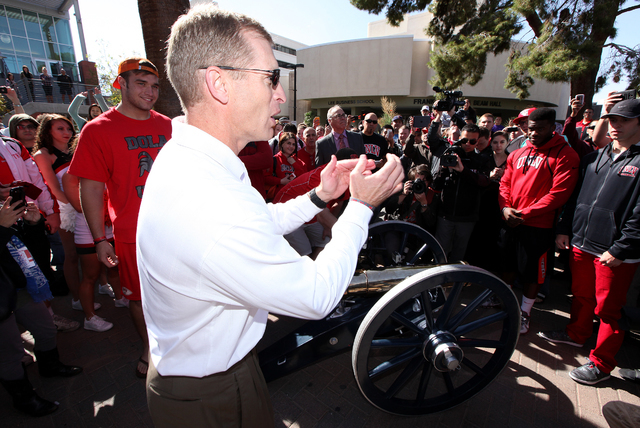 UNLV lost the first Battle for Nevada to UNR in 1969, but the first coat of paint on the prized Fremont Cannon was red. 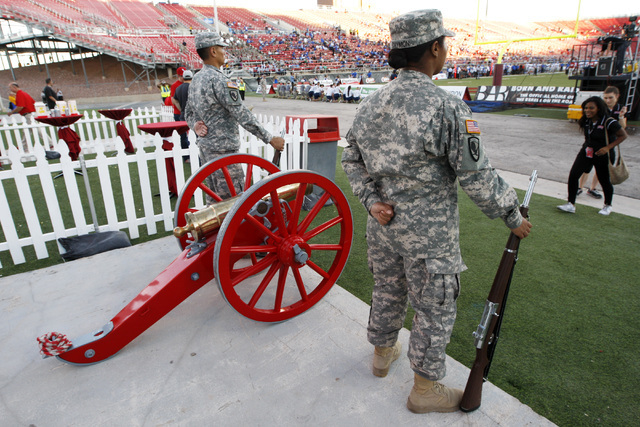 That’s because the cannon — awarded to the winner of the annual rivalry game, aka the Battle for the Fremont Cannon, who paints it either red or blue — wasn’t built until 1970, when the Rebels prevailed 42-30 in the first of eight wins in the next 11 meetings between the state’s only two football-playing universities. 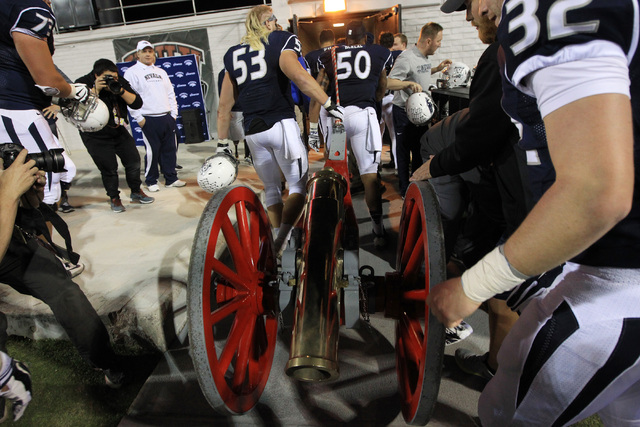 Bill Ireland, a UNR alumnus and the Rebels’ first football coach, came up with the idea to create the trophy to increase interest in the budding rivalry, and the cannon was built by the Kennecott Copper Corp. The prize is a replica of the howitzer used by John C. Fremont, a 19th-century trailblazer and politician, on an expedition to Nevada in 1843. Legend has it that Fremont violated U.S. War Department rules by taking the cannon with him without permission and then abandoned the weapon in a snowdrift in the Sierra Nevada mountains. 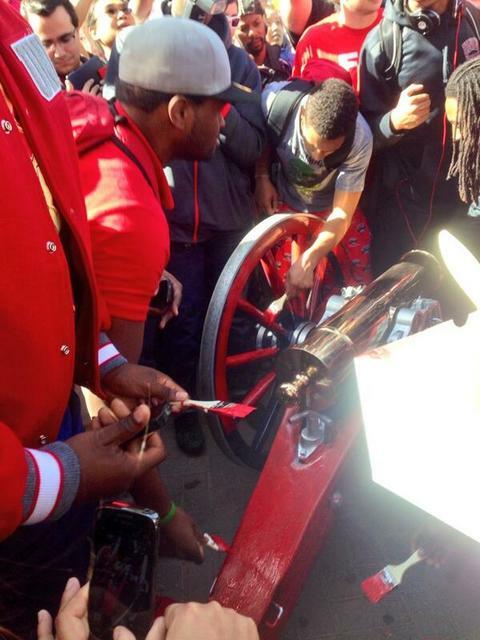 The cannon, which has been dismantled, dropped, damaged and restored over the years, was named college football’s best rivalry trophy in 2014 by Yahoo! Sports. “It’s unique. It’s real. You can tell by the weight of it when you try to move it around. It’s a really special trophy for the winning team,” said San Diego State offensive coordinator Jeff Horton, who coached at both UNLV and UNR, as well as at Wisconsin and Minnesota — rivals that annually play for Paul Bunyan’s Ax. 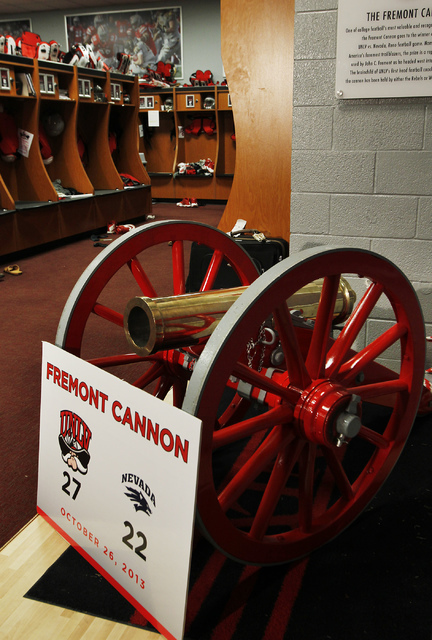 The Fremont Cannon used to be fired each time the team in possession of it scored a touchdown, but that tradition ended in the late 1990s, though the Wolf Pack still fire a different cannon after they score. In 1978, after UNR beat UNLV for the first time in five seasons, Wolf Pack players disassembled the cannon and coach Chris Ault then reportedly convinced security at McCarran International Airport to allow them to take its parts on the plane back to Reno. In 2000, after the Rebels snapped a five-game losing streak in the series, fans attempted to lift the cannon in celebration and dropped it. 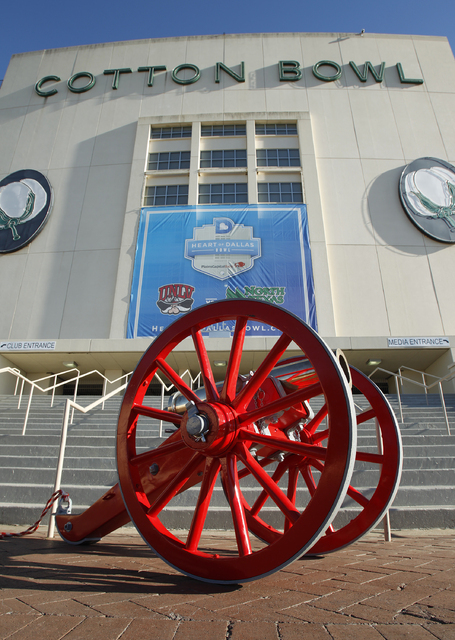 The UNLV athletics department repaired it at a cost of $1,500. 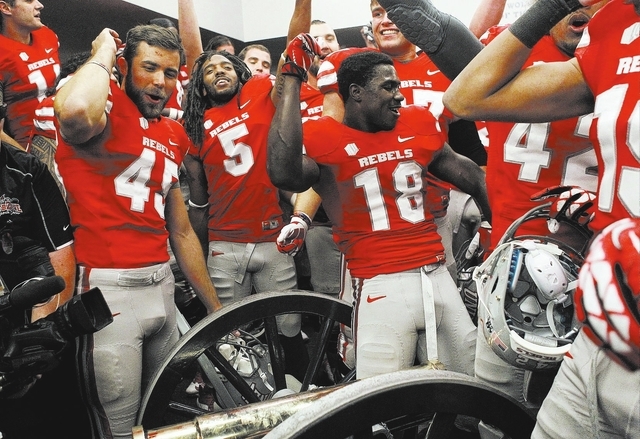 Despite topping the Wolf Pack only twice in the 1980s, the Rebels kept the cannon for seven years in the decade as the schools met only four times. The teams have met every year since 1989. 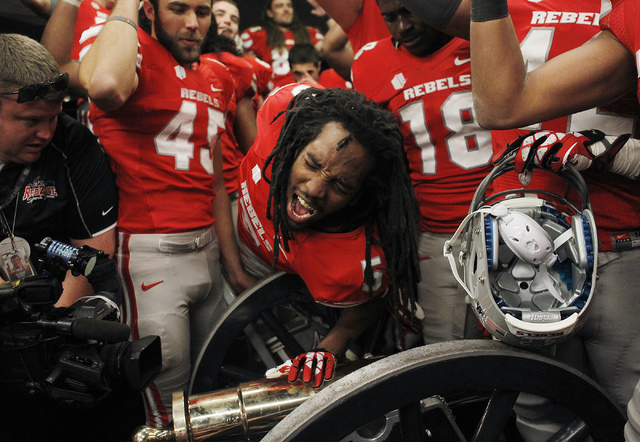 Besides having batteries, bottles and vulgarities hurled at him in Reno, Robinson — a College Football Hall of Famer — said his most indelible memory of the rivalry is the pure joy he witnessed when the Rebels painted the cannon red in 2000 for the first time in six years. 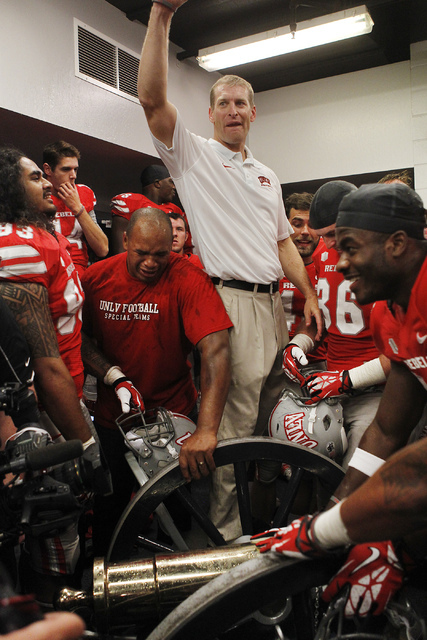 Since Robinson guided UNLV to five consecutive wins over UNR, the Rebels have claimed the cannon only twice in the last 11 years, including a 23-17 win in Reno last season in UNLV coach Tony Sanchez’s series debut. 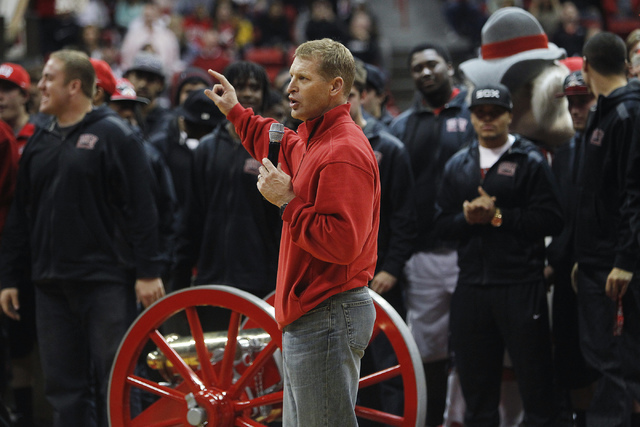 On Saturday, Sanchez will try to become the first Rebels coach since Robinson in 2004 to keep the cannon in back-to-back years. “It’s one of the coolest trophies in college football,” Sanchez said.